Hostal Splendid in Madrid, Spain. 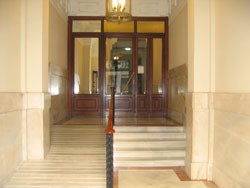 This hostel is located in one of the most historic and representative buildings of the Gran Vía, Madrid's most central street. From the rooms with balcony the views of Gran Vía are excellent. 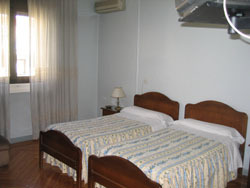 The Hostel is placed in the quietest part of the street, near the cinemas, theatres, museums, monuments, shopping centres. From the hostal you can reach the most important museums (El Prado, Thyssen, Reina Sofía) in a few minutes or walk to the Plaza Mayor, Puerta del Sol, La Plaza España, Palacio Real, La Almudena (the cathedral where Prince Phillip got married). The hostal has been recently renewed, with spacious and clean rooms, all of them with private bathroom, central heating, individual air conditioning, TV, safe. There are three elevators and a spacious hall. 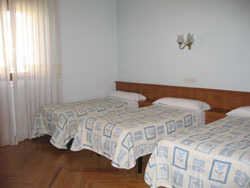 Location: The hostel is located in Gran Vía, one of the most important streets in the centre of Madrid with a wide range of means of transport. 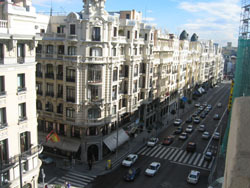 The nearest metro station is Gran Via (lines 1 and 5). There are many buses stop for the local buses, and there are also stops for the sight-seeing bus tour companies. There are several car-parks near the hostel (200 metres). This price is approximate. The exact tariff will depend on availability and the dates of your stay.